GREATER HARTFORD'S BUSINESS NEWS WWW.HARTFORDBUSINESS.COM VOLUME 25 • NUMBER 49 $3.00 DECEMBER 4, 2017 THE LIST: Largest Connecticut community colleges Newsmaker Holly Callanan, incoming CEO, Greater Hartford Association of Realtors. PAGE 3 PAGE 12 Executive Profile Richard Tavolieri climbed the ranks of accounting firm Deloitte & Touche, starting at the company fresh out of UConn to recently being named managing partner of its Hartford office. PAGE 8 Talent Retention Connecticut has adopted a new tax credit program aimed at enticing science, technology, engineering and math (STEM) college graduates to stay and work in the state. Special Awards Section HBJ reveals the winners of its second annual Best of Business Awards, which identifies some of the best B2B service provides in the region, as chosen by readers. 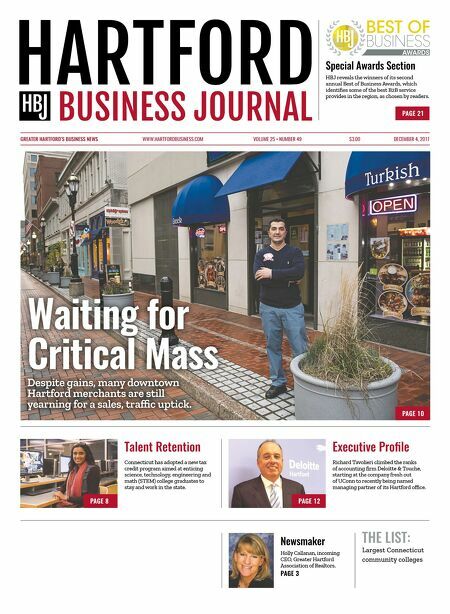 PAGE 21 PAGE 10 Waiting for Critical Mass Despite gains, many downtown Hartford merchants are still yearning for a sales, traffic uptick.